Since Army’s on a bye again this week, let’s talk a little about potential bowl match-ups. We all were (especially Rob) dreaming of a New Year’s Six Bowl. That would have been awesome, of course, but for the moment, it’s super unlikely. If UCF doesn’t make it in, the committee will take the Mountain West Champion, regardless of whether that’s Fresno or Boise State. The Mountain West champ will finish with an 11-2 record, and that’s pretty good. Let’s also acknowledge that because Army doesn’t have an official bowl tie-in, there exists a nightmare scenario in which the Black Knights are left home despite winning ten games. I can’t believe that will happen, but it could. Assuming we avoid the nightmare, these match-ups are all based around potential regional rivalries. I started by remembering that maybe 30% of the Army is from Texas and another maybe 15-20% is from the great state of Tennessee. At least half of the rest are from somewhere else in the South. The Army itself has a distinctly Southern flavor. Consider the four guys who make up the As For Football team. Two have roots in Tennessee—and specifically with the Volunteers. That’s half our team! Beyond that, more than 10% of the West Point Association of Graduates currently lives in or around Houston, Texas. Not only are there multiple Army bases in and around that part of Texas, we also have a substantial presence in the energy industry, especially in oil and gas. Obviously, bowl organizers will want to consider these demographics when booking the Black Knights. We want a matchup that makes sense culturally, that is not only convenient to the Long Gray Line but that also has a chance to draw casual fans on a regional basis—fans with connections to the Army itself. A lot of bowls are in warm, Southern locations, so this should not be super-hard. 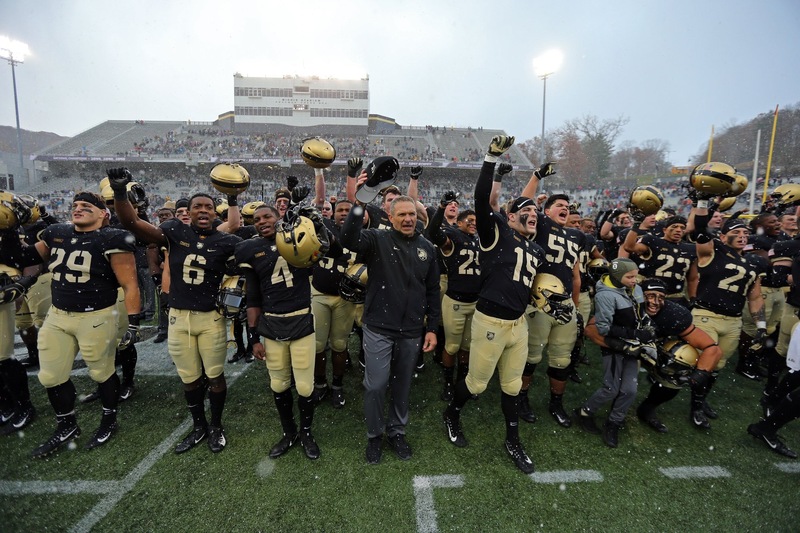 Witness how well Army drew against SDSU at the Armed Forces Bowl last year in Texas. Similarly, the Independence Bowl is already asking about Army. Not coincidentally, the Independence Bowl is located in Shreveport, Louisiana. In fact, the Army itself is a local cultural institution all across the South. That is less-true in the Northeast or out along the coasts. With this in mind, the match-up we want is not Army vs. Utah State or Cincinnati, though either of those would no-doubt provide compelling action on the field. Rather, the best opportunity is to pull a big, historic football school from a major conference. Those big fan bases, along with Army’s existing name recognition among Southern audiences, provide a unique opportunity to create a legitimately important regional college football spectacle. Tennessee. The Volunteers would’ve been perfect had they not dropped Saturday’s game to Vanderbilt. The fact that two of us at AFF are already Volunteer fans is what gave me the idea for this article. Vanderbilt itself is not a bad second choice, but I’ll admit that I was still pulling for the Vols. The Commodores just don’t inspire the same kind of fanaticism that I’ve seen from Volunteer fans. Vandy has been a frequent opponent of the Black Knights over the years, however, and I would love to see that rivalry renewed. But if given the choice, I’d like to see it during the regular season. #22 Texas A&M. The opportunity to match the A&M Corps of Cadets against the U.S. Corps of Cadets (USCC) should not be missed. It presents a natural rivalry that’s just waiting to be born. A&M went 8-4 this year with wins over Northwestern State, Louisiana-Monroe, Arkansas, Kentucky, South Carolina, Ole Miss, UAB, and LSU. That’s not a bad roster of victories. The Aggies may therefore wind up too high in the rankings to make this match-up realistic, but it’s still one that I would like to see. Should Army beat A&M, it would definitely ensure a Top 25 finish. Auburn. The Tigers are perhaps the most realistic choice out of the SEC. Plus, this match-up would give the 2018 Army team the chance to avenge the 1996 team’s last-minute loss in that year’s Independence Bowl. Auburn went 7-5 this season with wins over Washington, Alabama State, Arkansas, Southern Miss, Ole Miss, Texas A&M, and Liberty. A win over Auburn virtually assures Army of a Top 25 finish. Out of the SEC: I grew up watching the SEC, so any of the eligible teams would be great matchups to me. South Carolina and Mizzou would be my first choices from the available group. Out of the ACC: Any of the teams in the Coastal division would be okay, but my personal preference would be for Virginia Tech, Virginia, Miami, and then Pitt in that order. I don’t want a rematch with Duke, and I don’t particularly need to see a triple-option vs. triple-option slugfest against Georgia Tech, either. Out of the Atlantic, I’d like to see NC State or Boston College. Syracuse would be great for the potential of an NY State rivalry, but I think the Orange might be headed for a New Year’s Six game, and anyway, that’s not a match-up you’d stage down South. Out of the Big 12: Baylor and Iowa State are my top choices. ISU is probably the most intriguing match-up for on-field action, but for the purposes of bowl scheduling and attendance, you really must give the Texas team primacy of place. For what it’s worth, I doubt Army would agree to a match-up with OSU considering the Cowboys’ illegitimate ongoing claim to a 1945 national championship. Not many teams are willing to take shots at West Point’s 1940’s-era wartime record, but Oklahoma State went that way with it. They don’t love freedom, I guess. “Support the Troops” is just a bumper sticker. I mean, there’s no proof that the Cowboys’ athletic department is chaired by card-carrying Communists, but I’ve never heard anyone from the school deny it, either. Seems suspect, am I right? Out of the Big 10: I could see Army vs. Purdue or maybe Iowa. None of the rest of the potential match-ups do much for me. Out of the PAC-12: I’d like to see Utah or Stanford. Utah because you meet a fair number of officers out of that state, many of them Mormons. Our Mormon friends always show up on time, in the right uniform, and ready to do their duty. Meanwhile, Stanford is a perennial powerhouse, such that an Army win would do a lot to ensure a Top 25 finish. 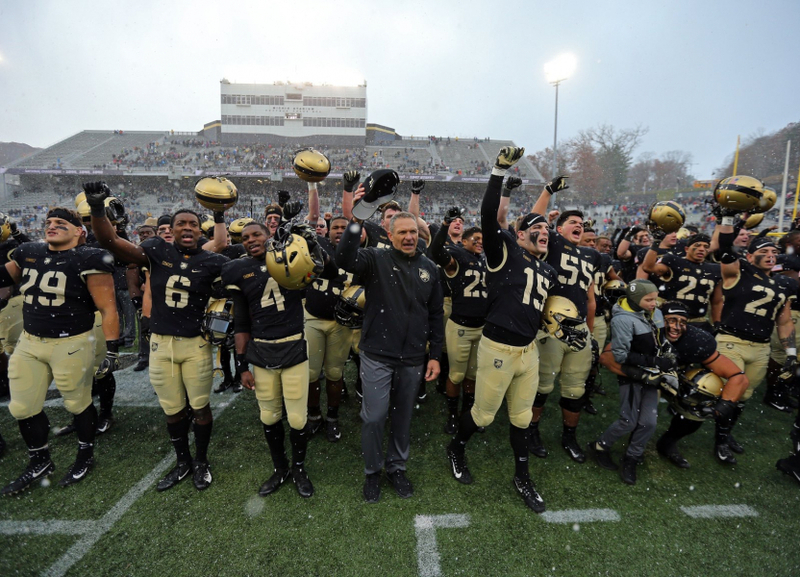 With all of that in mind, let’s assume Army does indeed wind up in the Independence Bowl. That seems at least somewhat likely at this point, though it is far from guaranteed. The Independence Bowl has ties to the SEC and the ACC with the ACC looking more likely to fill its slots while the SEC is probably gonna fall short after sending multiple teams to the New Year’s Six. Army would then take an SEC spot against an ACC opponent. That’s probably the most likely scenario, though it is by no means the only scenario available. New Year’s Six Bowls. Notre Dame is considered an ACC team for the purposes of bowl selection. If they don’t make the Playoff, they will certainly wind up in a New Year’s Six. Syracuse may have a shot as well, though I’m not sure I would lay money on that after their loss to Notre Dame last week. Tier 1 Bowls: Belk, Music City or Tax-Slayer, Pinstripe, and Sun Belt. Four teams: Syracuse, NC State, and Boston College definitely. Pitt probably has the inside track on the fourth spot since they won the ACC Coastal. Tier 2 Bowl: Camping World. Let’s put Georgia Tech here and acknowledge that there are a bunch of teams in the ACC with 7-5 records. Additional Bowls: Military, Independence, Quick Lane, Gasparilla or Heart of Dallas, and Birmingham. Candidates at this level would then include Virginia, Miami, Virginia Tech (assuming they beat Marshall next week), Duke, and Wake Forest, probably in that order. If this is indeed the way it plays out, I’d make the match-up against Virginia Tech my first pick. That would pit the USCC against Tech’s Corps of Cadets for a postseason quasi-service academy showdown. Folks would like that. Both schools’ fan bases travel pretty well, too, so I think this particular game would make some money. In the end, money is the most important factor in setting these match-ups. A game against Virginia would work for some of the cultural reasons mentioned above, though without the military ties. I have to admit as well that I would love to see Army take on Miami. Not because Miami has such great ties to the military but because the Hurricanes are such a strong traditional college football powerhouse that I’d just really like to see that match-up. Got thoughts? Let us hear ‘em below. A lot of people are picking Army for the armed forces bowl. In Ft worth. I really don’t want the Independence bowl. Shreveport is really a not very nice town, and the stadium is ancient. We were there with USAFA in 2010. I am an Army grad with a son that went to USAFA so we saw 3 bowl games while he was there. The armed forces bowl or any of the Texas games would make for a much better environment for the game. Andrew, thanks for the note. We talked about this some on the podcast this week, so if you’ve not listened to that, I recommend it. Your point is well-taken. I like the Independence Bowl for the potential match-up. For attendance, tho, I agree that Texas would be much, much better. I think I’d prefer an ACC team in the Independence Bowl. Playing OSU in the Armed Forces Bowl would be interesting in my household as my wife is an OSU grad. I’d really love to play a Pac12 team though since I grew up on the west coast. Another shot at Stanford would be fun. This one is all about avenging our loss 22 years ago! Shreveport is a crappy town. The stadium is decrepit. However, here’s what our program really really really really really really needs. More than anything else. More than a ranking. More than a CIC. More than a winning season. More than being undefeated at home. WE NEED A MARQUIS WIN OVER WHAT IS VIEWED AS A BIG TIME LEGITIMATE PROGRAM! Auburn may not be as strong as they have been but they are no doubt stacked with Talent. They are without question a marquis team that if we were to beat them then everyone would take notice. They aren’t viewed like Duke, or Hawaii, or Buffalo, or Temple, or even Navy or Air Force. This is an Auburn program that in the last 9 seasons won a National Title in 2010, went back to the National Championship game in 2013 been back to the National Title game in 2013, played in the SEC Championship last year and has beat Alabama three times in that span. They are legitimate in every way as a program. A win vs Auburn would do wonders for Army and really help to validate our program to recruits, sports writers and media, and fans. BTW, this could be similar to what happened in ’84 and ’86 vs Tennessee. In ’84 Jim Young went to Knoxville and Tied Johnny Majors Volunteers. That put us on the map but in ’86 he went back and beat them at Neyland. No doubt that put Army back on the National Map in the 80’s. We’ve yet to get that signature win. I think this could be the matchup to do it!